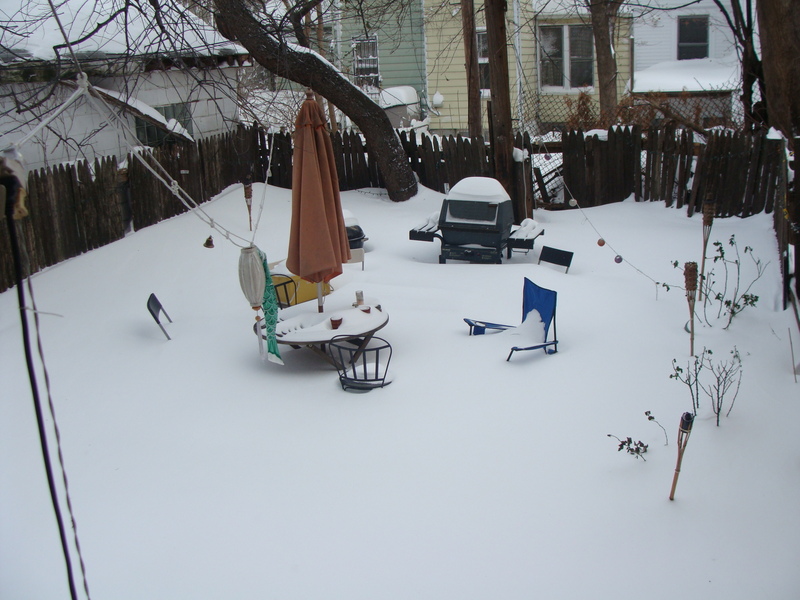 We haven’t had much of a winter so far…which is fine with me. I dislike the cold part of the year and I was happy today when it was unexpectedly sixty and I got to bike in to work. And yet there is supposed to be a blizzard tomorrow! 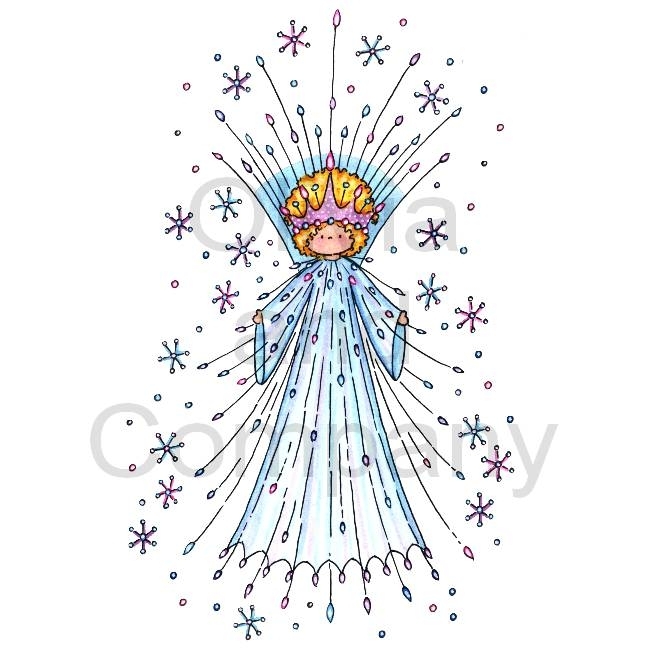 So, to celebrate the season of snow and ice here is a little gallery of crowns which are meant to resemble snow and ice. Some of them are really pretty—especially the ones which are actually made of icicles (which I have always loves for their otherworldly frightful beauty). 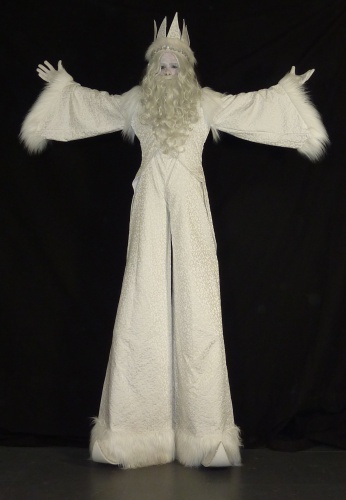 I wish that more of them looked like snowflakes though—they really have their own disturbing alien allure. Anyway, I hope you are inside enjoying a bog mug of your favorite hot beverage and nestled by a fire. And for my tropical and southern hemisphere readers, why do you guys never invite me to come visit? Happy blizzard. I’ll see you all tomorrow. This post is really the second half of yesterday’s snowstorm post. After I realized how pretty the snow in the backyard was, I decided to put on all my winter gear and walk around the neighborhood. For reasons which elude me entirely, I live in a really beautiful neighborhood (well, I know why I live here, I just don’t know how I continue to do so). The majority of the houses were built during the first twenty years of the twentieth century and they have an outstanding grace and style which modern houses lack in every way (although my landlord and I can both vouch that these magnificent old homes start to fall apart somewhat during prolonged cold weather). 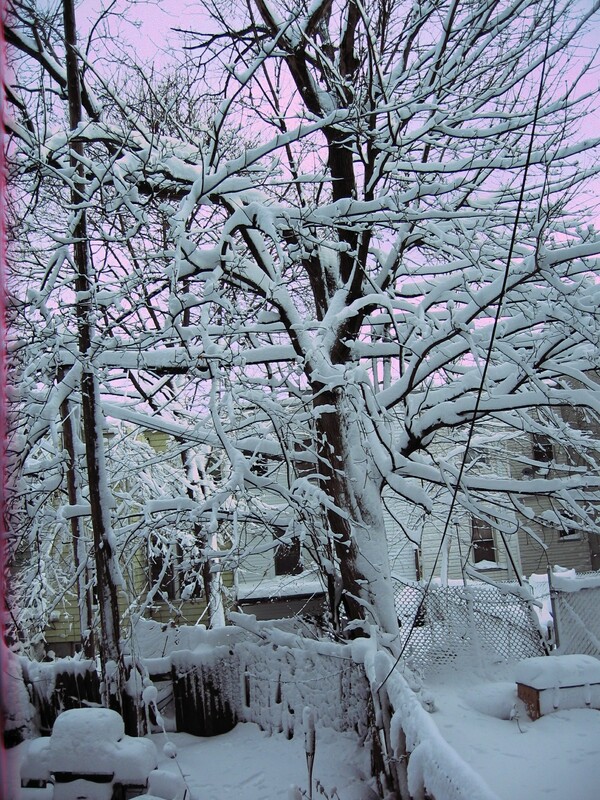 Sadly, as always with my photography, I don’t feel like I really captured the dark beauty of the blizzard or the decrepit splendor of this part of Brooklyn. 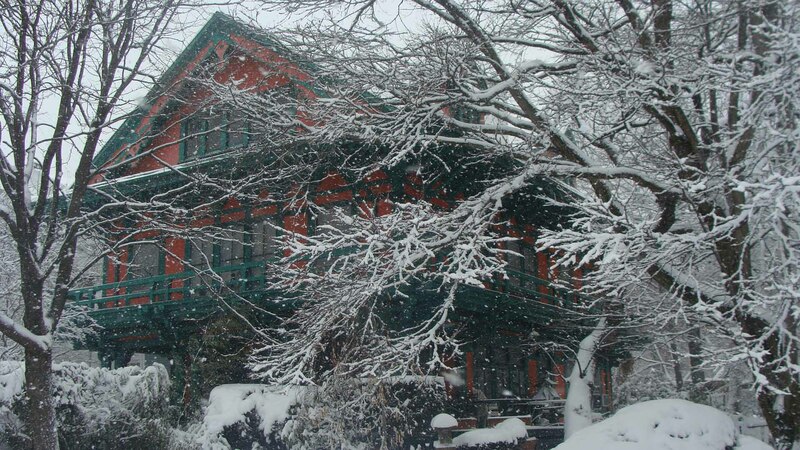 Still the pictures are worth looking at just to appreciate the lovely houses of Ditmas Park. 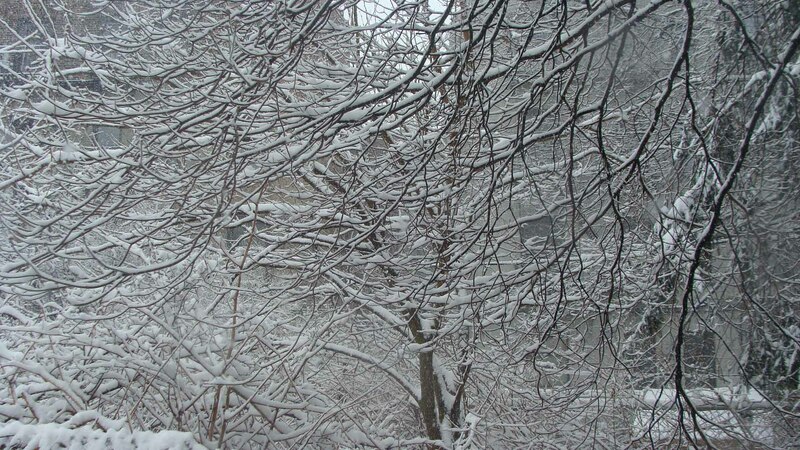 Also, with any luck, we have said farewell to this sort of snowstorm for a good long time. 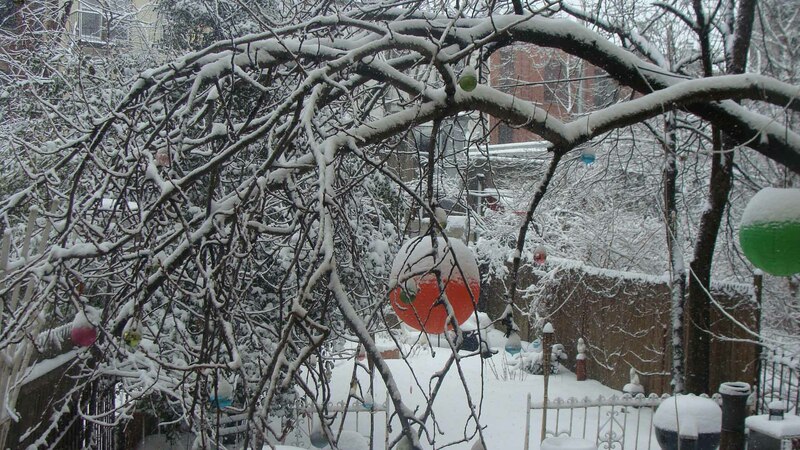 Hopefully you are looking at these photos in the tropics or in June and the snow provides only a frisson of wintry intensity rather than weary resignation which all New Yorkers feel as the winter of 2014/2015 draws onward toward its conclusion. It’s March! As spring takes hold across the United States, I thought I would show some pictures of my garden as the first tender shoots begin to… argh! [indecorous remarks withheld by censors] Well, OK, it looks like winter is going to be here a bit longer. I guess it’s pretty in a cold majestic way, right? We can learn to live like this with no hope or resources…or does anybody maybe want to trek south like in “The Road” and build a New New York somewhere closer to Cuba? 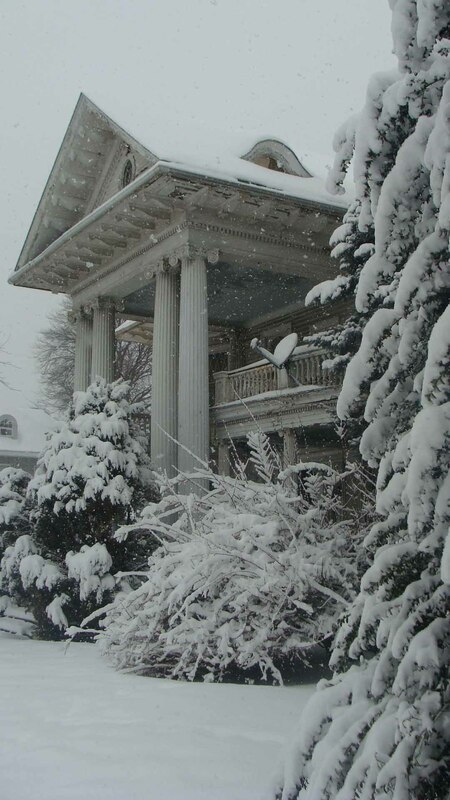 Well, anyway, here are some winter pictures of the Ditmas Park neighborhood of Brooklyn. 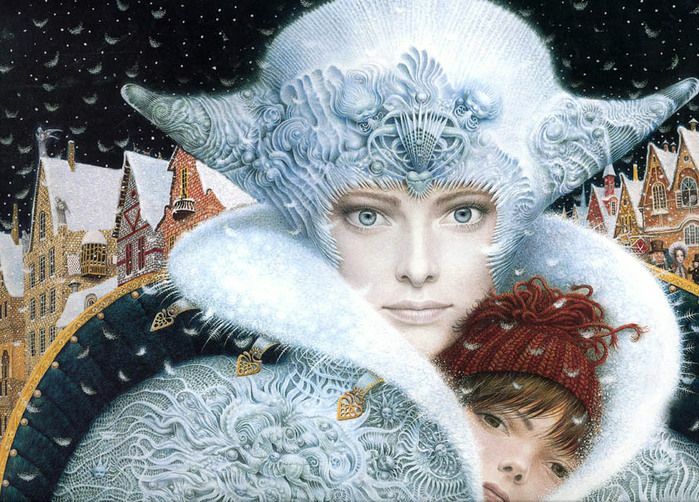 I know it looks like something out of a darkly beautiful Russian fairytale, but I assure you, there is a dynamic city somewhere behind all of that snow and ice. We’ll check back on spring in a few weeks… In the meantime maybe read some Tolstoy and sacrifice some more sheep to the dark gods? 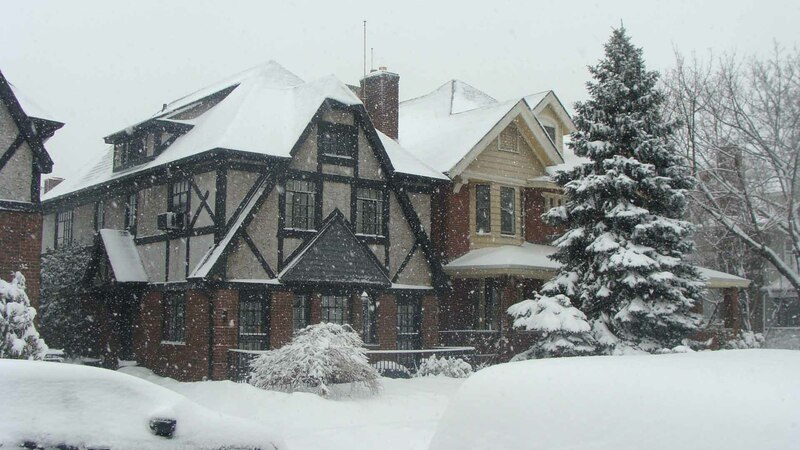 This is the time of year when winter has long outstayed its welcome, but no traces of spring are anywhere to be found. 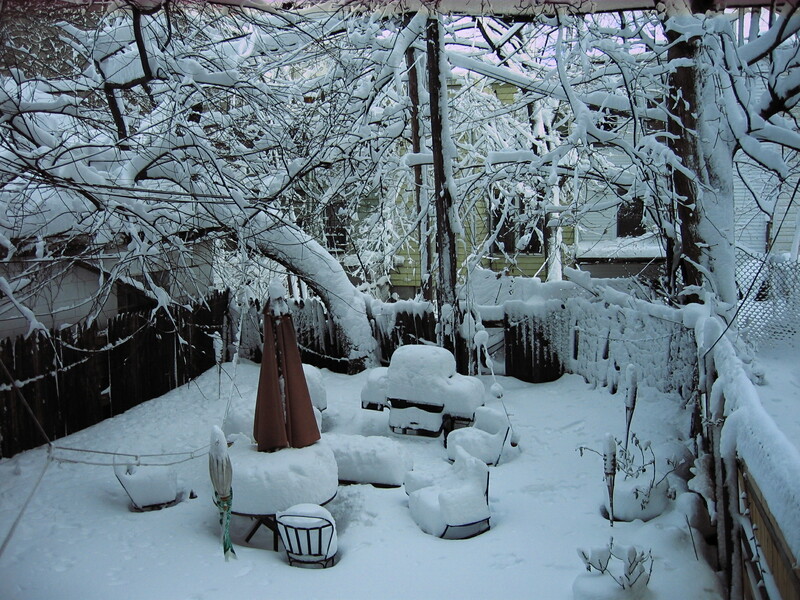 My garden is covered in a sheet of filthy ice and seems likely to stay that way for the conceivable future. The few spots not buried in snow or slush reveal only grim frozen mud. 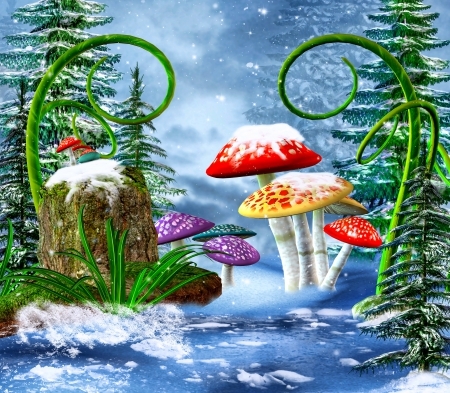 In such circumstances it is difficult to remain cheerful or find any beauty whatsoever in the winter, so instead of writing an actual meaningful post about real things, I have found a bunch of crazy pictures of fantasy winter gardens which do not (and probably could never) exist. 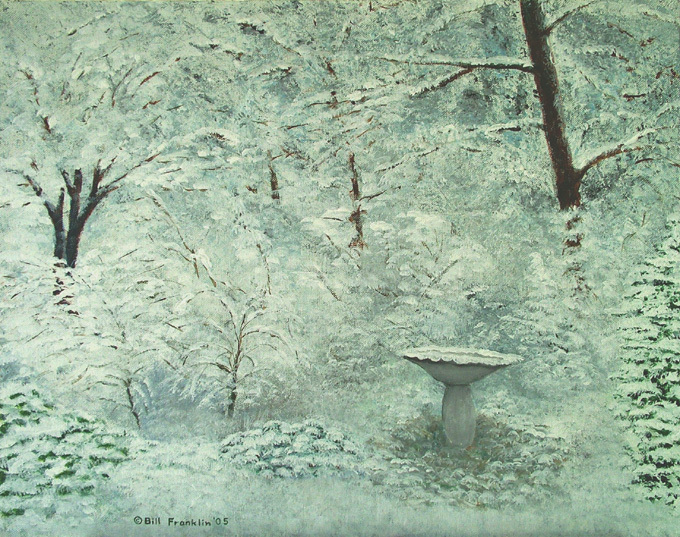 Although admittedly these paintings portray gardens wholly in the grip of winter, the picture gardens are clearly make-believe (a reassuring contrast with the actual all-too real winter just outside). These images are also pretty (which is also in contrast with the actual world). Wait, is this a photograph? 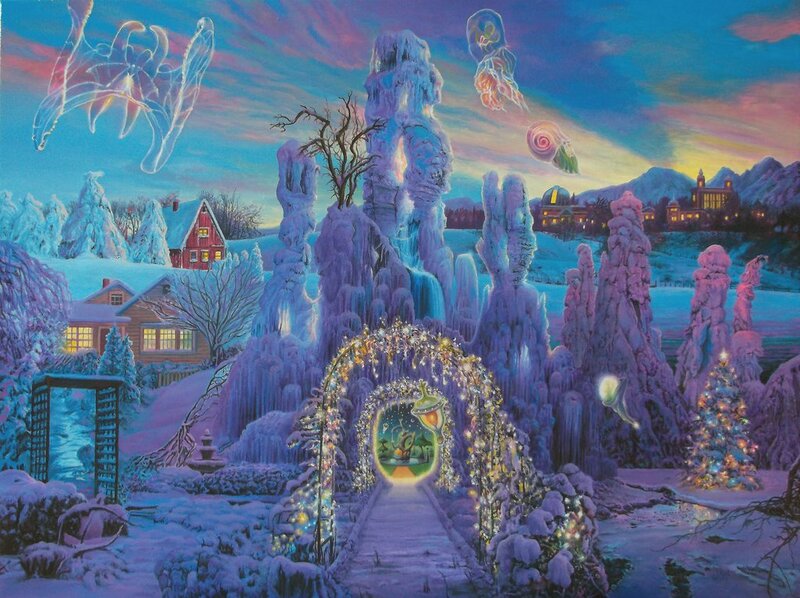 Let your mind wonder through the whimsical topiary, frozen palaces, and strange icicle bridges of these paintings and be of good cheer. March is nearly here and spring will probably come again, even if that seems utterly impossible at present. 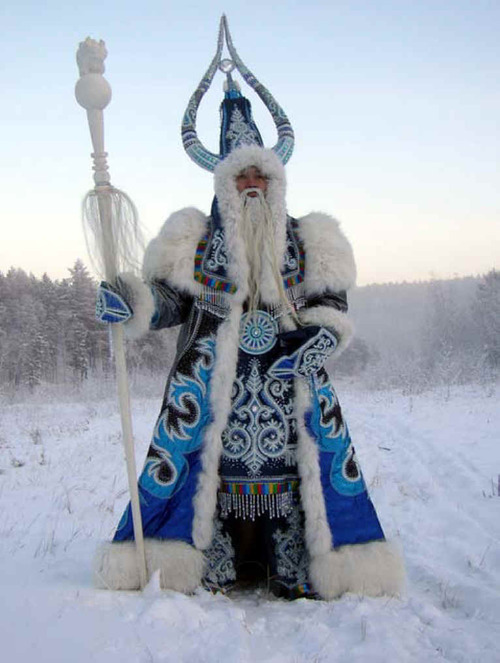 In the meantime, I am going to get under the covers and read a book about heroes slaying frost giants and breaking the power of evil ice wizards. 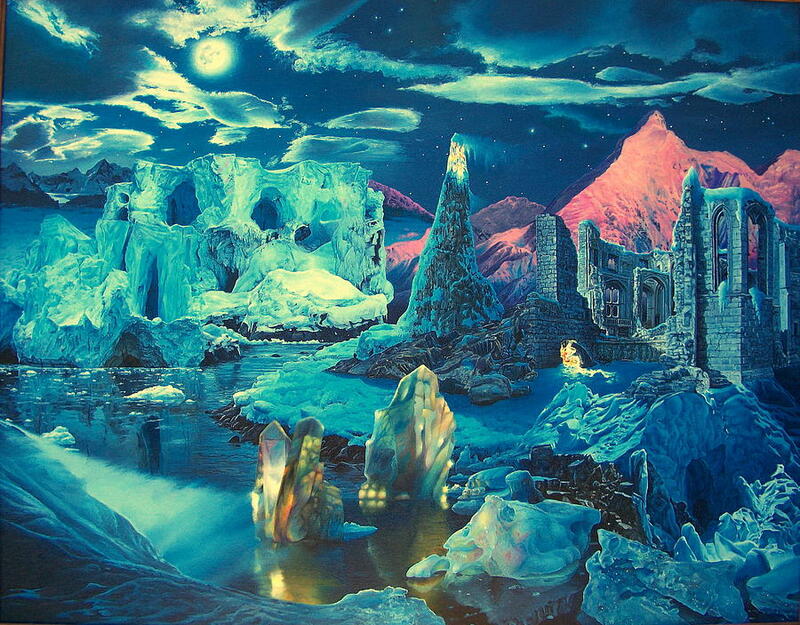 Here is a painting appropriate for the grim depths of winter. 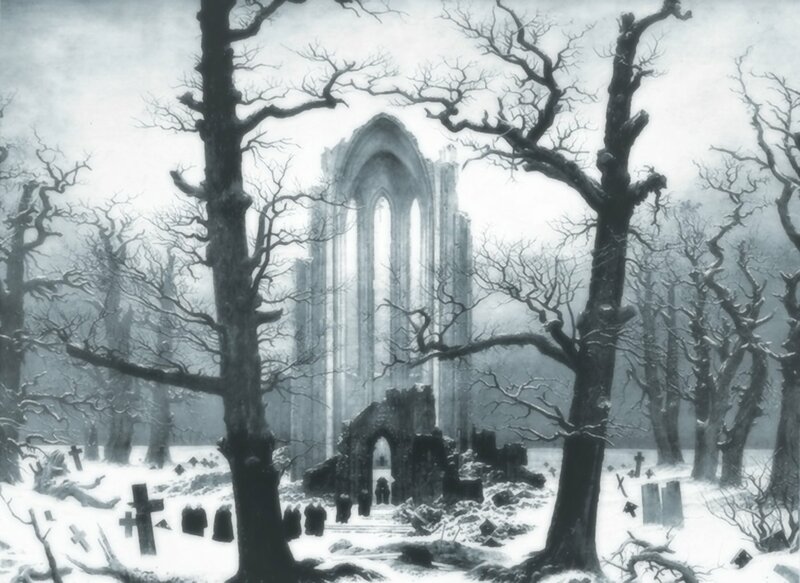 This is Klosterfriedhof im Schnee (Monastery Graveyard in the Snow) painted by the melancholy master of German romanticism, Caspar David Friedrich (whose foreboding works keep appearing on this blog). The melodramatic work highlights the transitory nature of all things. All that remains of a once grand Gothic abbey is the soaring arch of the nave which hovers ghostlike in the center of the composition. Around the ruins are vast oaks reaching out broken limbs toward the church like desperate spectral worshipers. Not only are the trees ancient, gnarled, and denuded by winter, but one also senses that they are not healthy oaks (a tree surgeon would probably shake his head sadly at their prospects). The abbey grounds have been transformed into a cemetery and the monks trudge through the necropolis like tiny insects dwarfed by the desolate trees, the headstones, and the abandoned church. Monasticism was on its way out in Germany when Friedrich painted this, and it is deliberately anachronistic. The monks too may be ghosts. There is a final meta-layer to this vanitas painting. 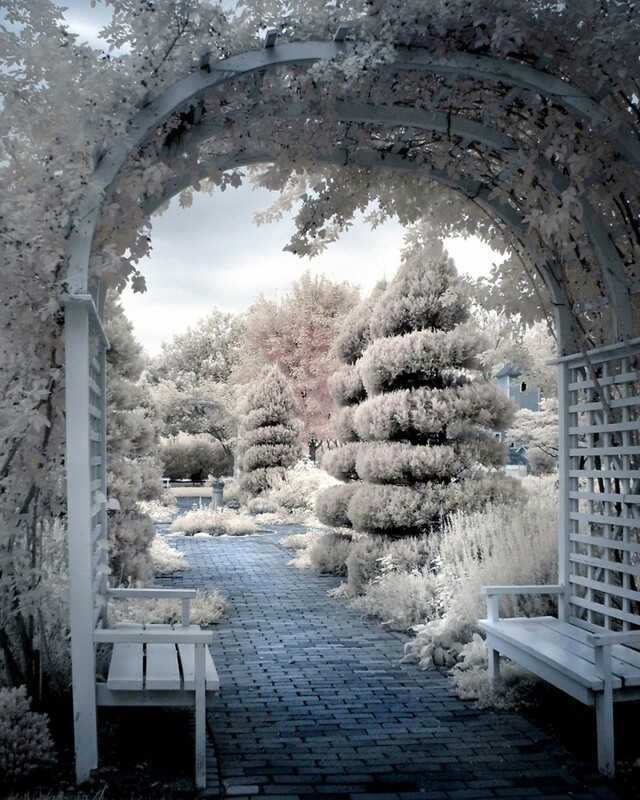 As you have noticed, the photograph of the work is black and white. This is because it is an old photograph which was taken before the painting itself was destroyed in an American air raid on Berlin during the chaos of 1945. The lack of color suits both the composition and the theme: one imagines that Friedrich might appreciate the irony, if he were not himself gone, like everything in this painting and the painting itself. 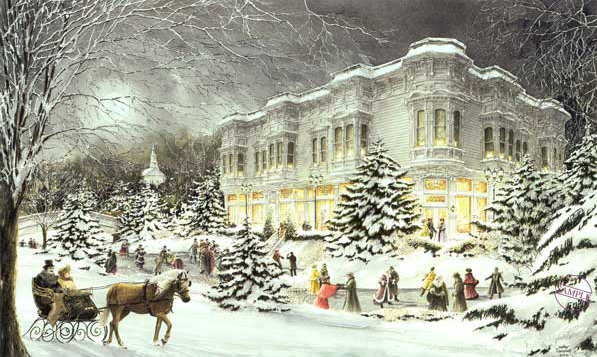 In the Northern Hemisphere today is the first day of winter. 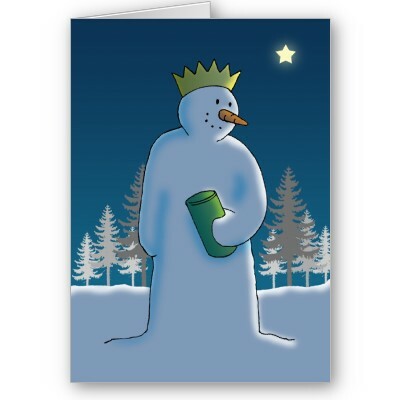 As always, this change of season occurs on the winter solstice, the shortest day of the year. Last night was actually the longest evening of the year—so I suppose we can now look forward to the gradual return of the sun bit by bit (even as the weather worsens for the true cold of January and February). 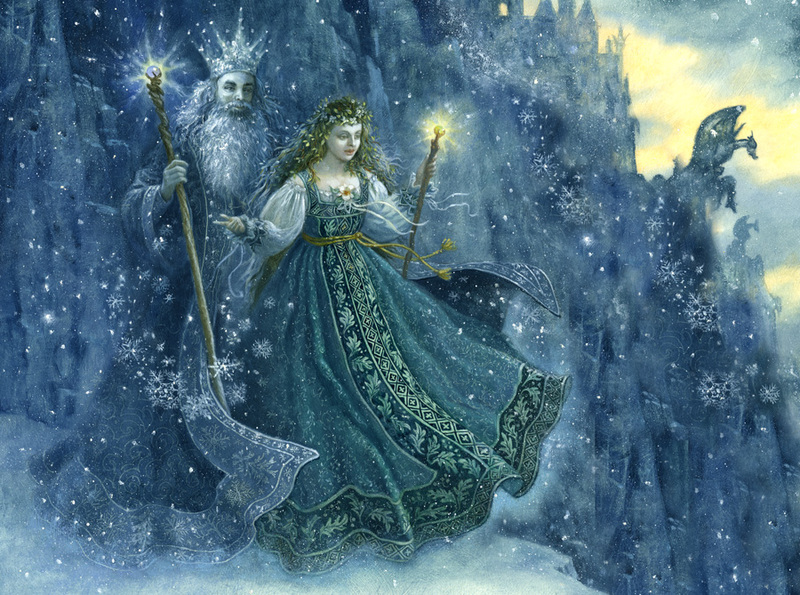 To celebrate winter (admittedly my least favorite season), here is a gallery of winter personifications. 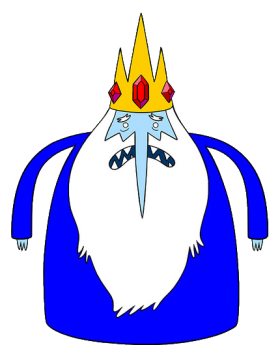 Each wears an icy crown and most of them look cold, haughty, indifferent, or cruel. I am including these ice kings and queens under Ferrebeekeeper’s mascot category even though they are not really cheering for a team or a product. 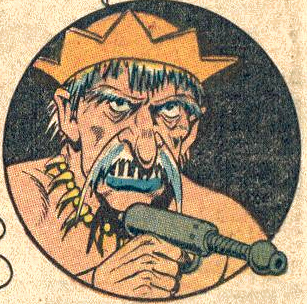 “Personification” seems close enough to the definition of mascot to ensure that I won’t get in trouble from WordPress (although, as ever, I invite any comments or aeguments below). Katy Perry? 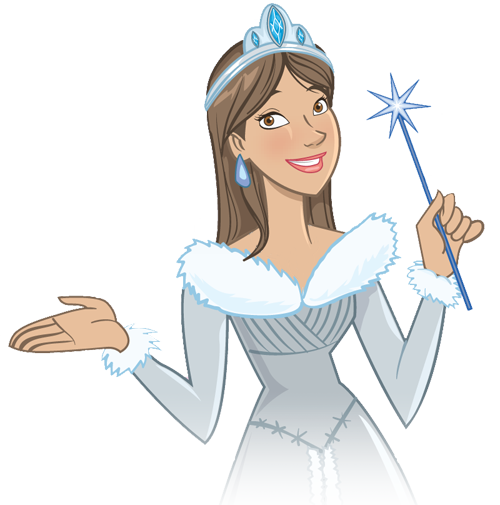 How did you get in my blog and why are you dressed as queen of winter? 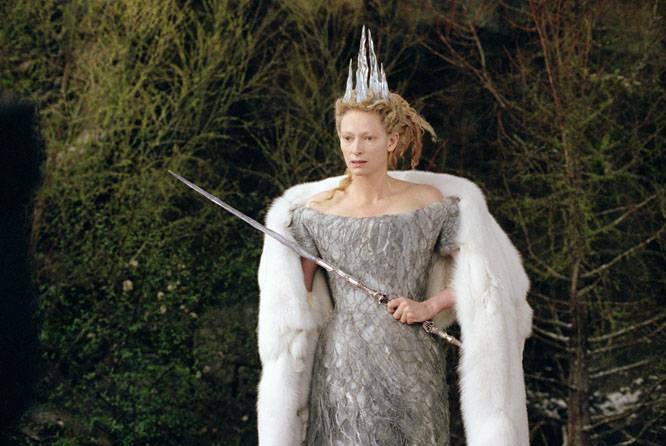 I would hang around and make some funny comments about all of the monarchs of winter but all of the white hair and piercing eyes are starting to weird me out a little (to say nothing of Katy Perry’s vacuous stare). Have you ever noticed how summer, spring, and fall are not represented as maniacal tyrants with wicked crowns? I’m looking forward to getting back to those other seasons. In the mean time have a wonderful winter! Argh no, it’s still a frustrating picture. What is the point of gardening or painting or toymaking or starting anything? It’s all just going to get ruined by the ineluctible forces of entropy. 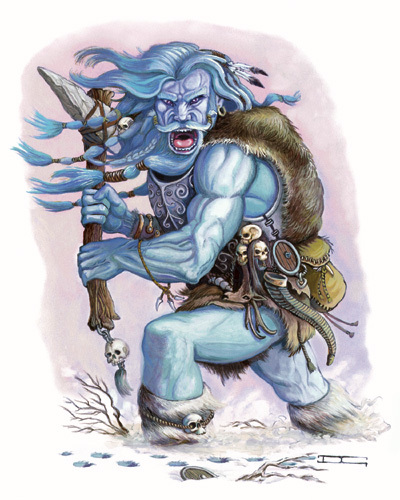 A Frost Giant pushing to end the world of order and crush all things under an endless cascade of ice...wait, a minute, how did this picture get in here? 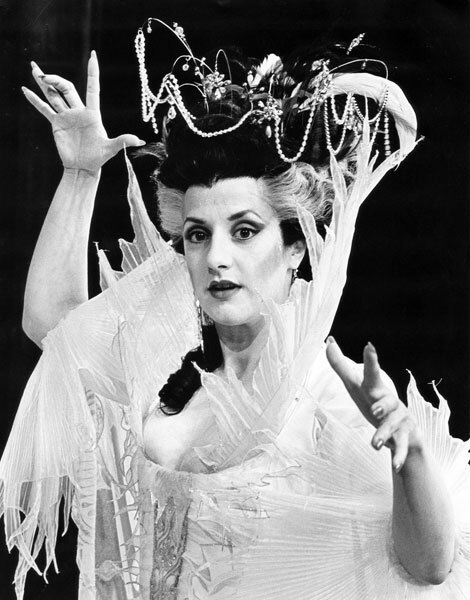 Welcome back from the Saturnalia…er…Christmas break. This year is winding down fast. Later on this week we’ll do some 2010 wrap-up, but for right now let’s concentrate on what everyone else is concentrating on—the crazy weather. 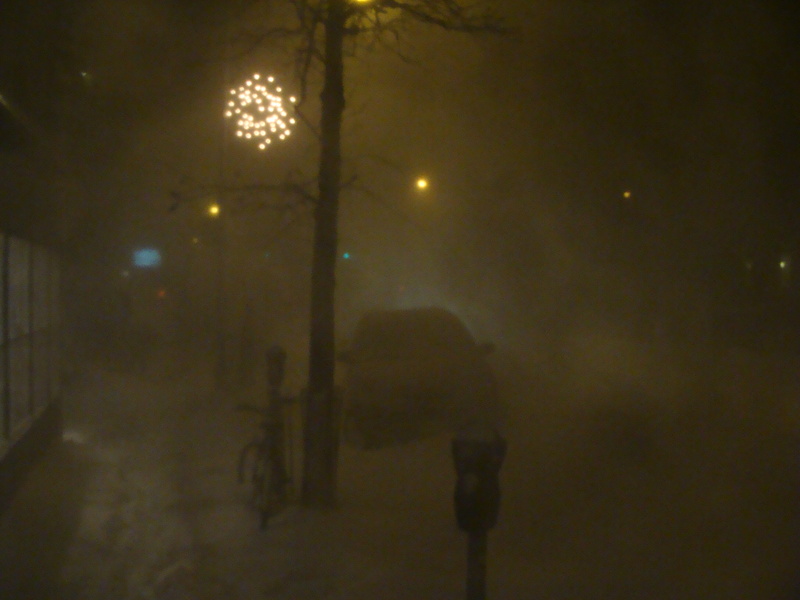 Yesterday and last night New York City was socked by the worst blizzard I have ever seen here. 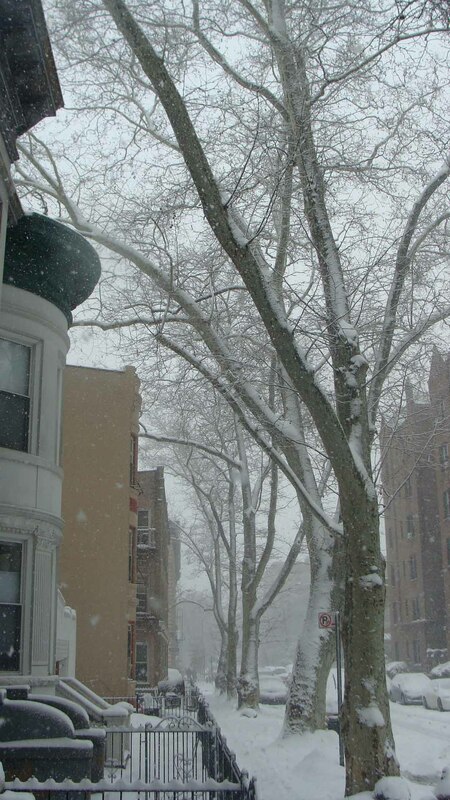 Around 9:00 PM last night I walked out along 7th avenue in Park Slope to be confronted with a snowscape straight out of a Jack London story (I braved this fearsome weather to return Despicable Me to the video store on time). Evil winds whipped great sheets of snow into my face and reduced visibility down to 10 meters or less. Huge snow drifts blocked the roads and made travel impossible. 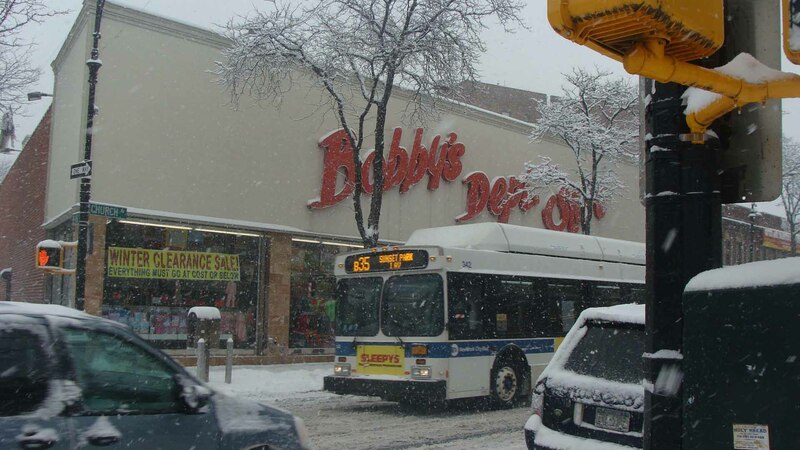 The BMWs and Audis of Park Slope’s worthy burghers were rendered useless. A great dim shape looming in the white waste was revealed to be an abandoned city bus trapped in a drift with its emergency blinkers turned on–a restlessly dozing behemoth. This morning there was a snow drift in my room formed by snow blowing through the crack under the garden door. The same bus was still there this morning on 7th Avenue. I made my way to work this morning walking down the middle of the road—no vehicles were operating. I had to hike through the drifts and ice to a distant train since the F was not operating (and probably still isn’t). Even Rockefeller Center seemed empty. Sitting in a plaza amidst impassible streets the great Christmas tree is half covered in snow and hoarfrost. 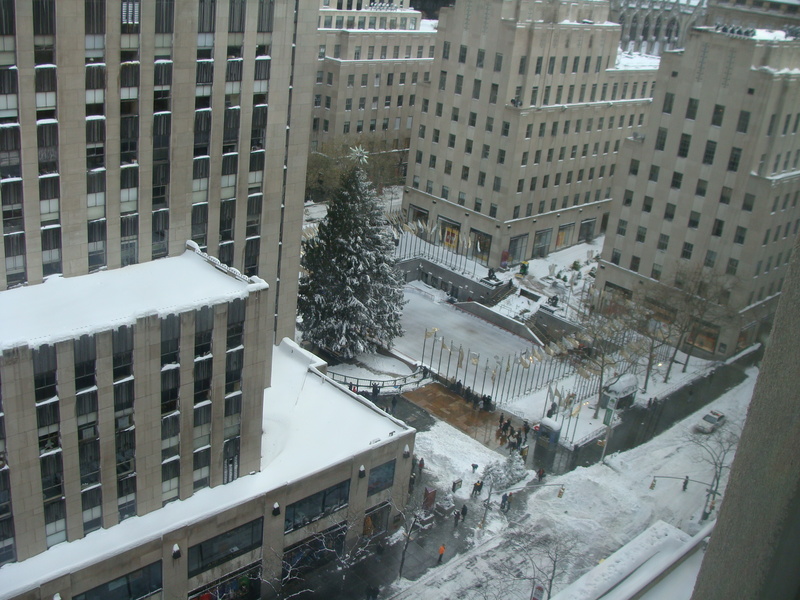 The Rockefeller Tree seen from the break-room at my office this morning. Note the absence of traffic! 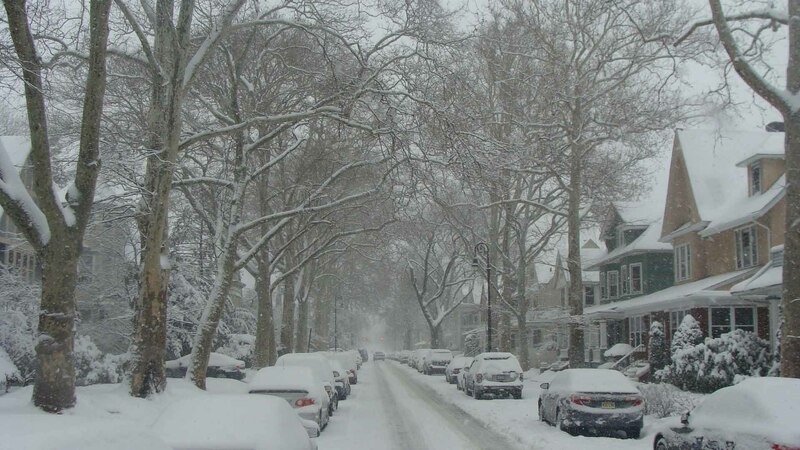 All told, New York received 20 inches of snow (more in some places) with winds gusting up to 40 miles per hour. 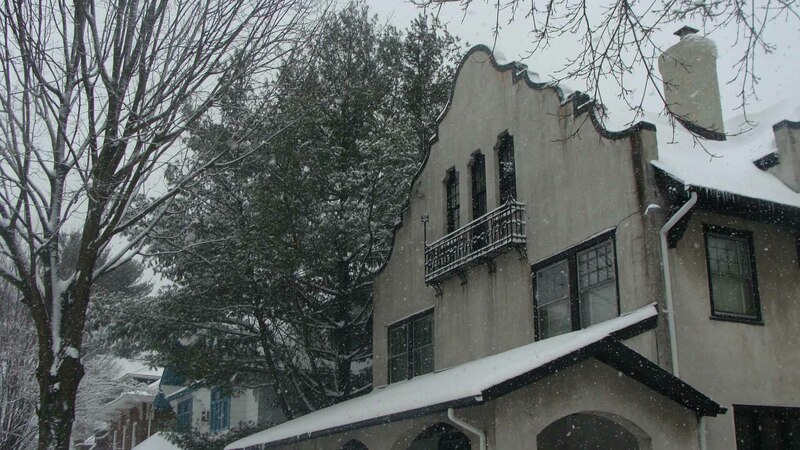 According to the US National Weather Service the blizzard was the result of a low pressure system which originated off North Carolina which means Georgia and South Carolina have had their first white Christmas in over a century. Holiday travelers are stuck where they are–since airports all along the coast are closed. 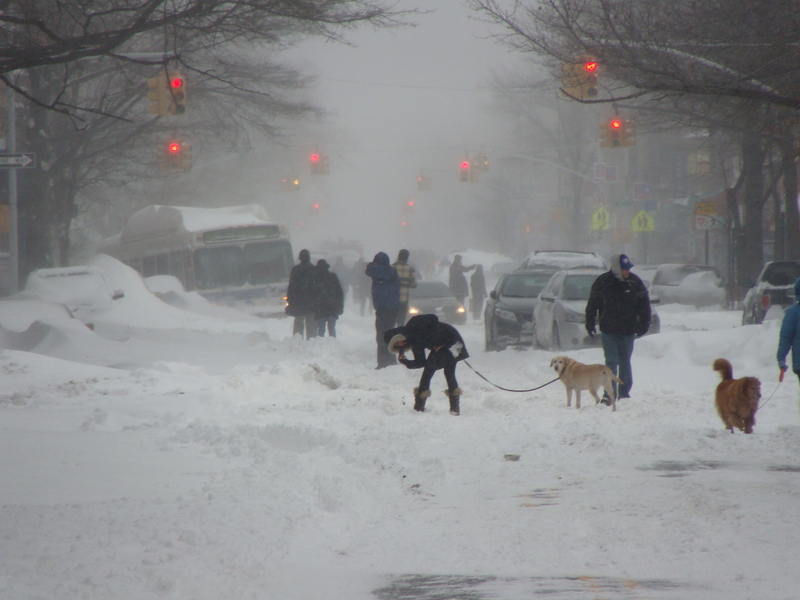 I shudder to think of people returning to New York from Europe–which was hit by its own blizzards last week. So what is up with this weather? 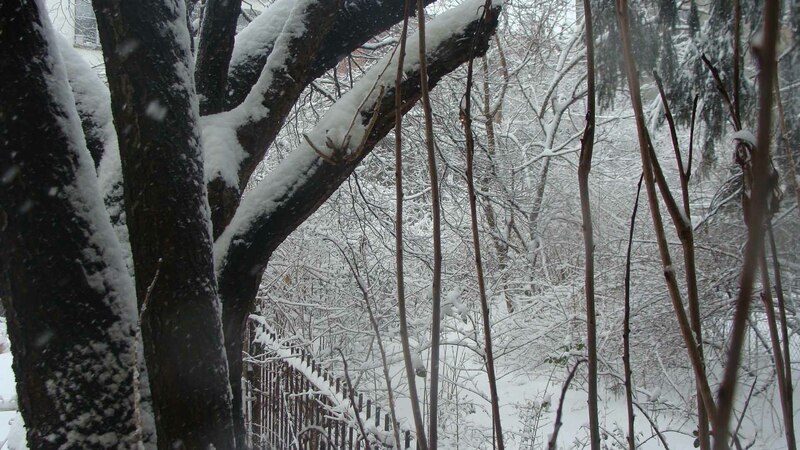 Park Slope Brooklyn has been hit with a tornado, a hailstorm (which I didn’t blog about but which flattened the autumn remnants of my garden with gumball sized hail), and this blizzard. We had some fearsomely hot days this summer as well—which I didn’t think to mention since I kind of like them. Since global climate scientists have no definitive answers, neither do I–however it bears remembering that 2010 was a year of greater than average volcanic activity. 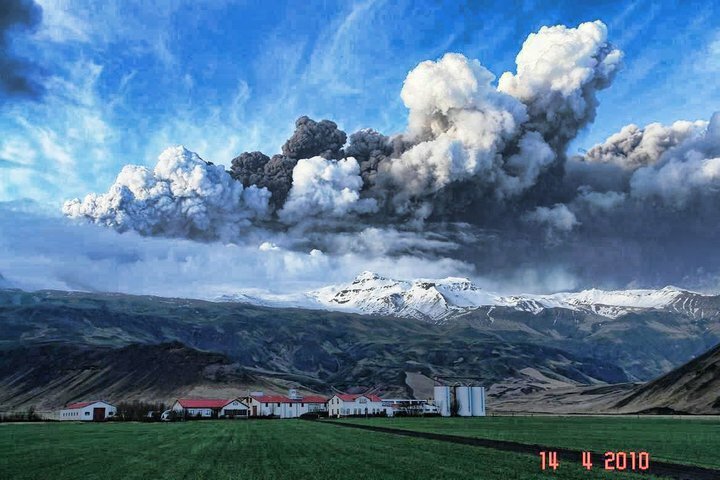 Not only did Eyjafjallajökull in Iceland disrupt Europe’s air traffic for weeks by erupting directly in the Jet stream. It was joined by Mount Merapi erupting in Indonesia and various Siberian and Chilean volcanic events (you can review dramatic photos of the year in eruptions on NASA’s website). These eruptions come in a time of extremely strange solar weather and, in the bigger picture, a great ice age is still ending (not to mention whatever climate change we have caused with our love of fossil fuels and our stubborn refusal to move forward researching and funding nuclear power options). Of course this is anecdotal speculation on my part. I am certainly not an atmospheric scientist, but merely a hapless office drone with extremely cold wet feet. Even so, I hope you will buzz back to Ferrebeekeeper this week so we can look back over the year and think about what is coming. In the mean time stay warm out there!